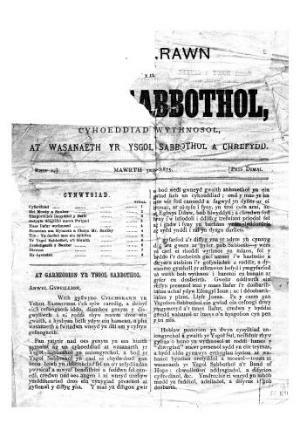 A weekly Welsh language religious periodical serving the Sunday schools of the Calvinist Methodist denomination. The periodical's main contents were religious articles alongside news related to the Sunday schools and poetry. The periodical was edited by the minister John Richard Hughes (1828-1893) with the minister Richard Jones (Glan Alaw, 1838-1925) serving as poetry editor.